Black infinity wedding band ring made with aircraft-grade titanium. The band measures 8mm wide (as shown), but is also available in your choice of 6mm or 7mm. This ring is for both men or women (based on your desired ring size). 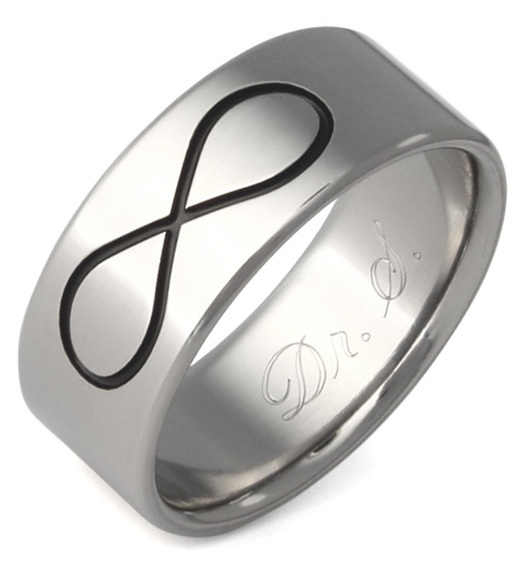 The infinity symbol represents your everlasting love for one another, a love without end. While most titanium wedding bands are mass-produced in China, this ring from Apples of Gold Jewelry is proudly made in the U.S.A.! We guarantee our Black Titanium Infinity Symbol Wedding Band Ring to be high quality, authentic jewelry, as described above.